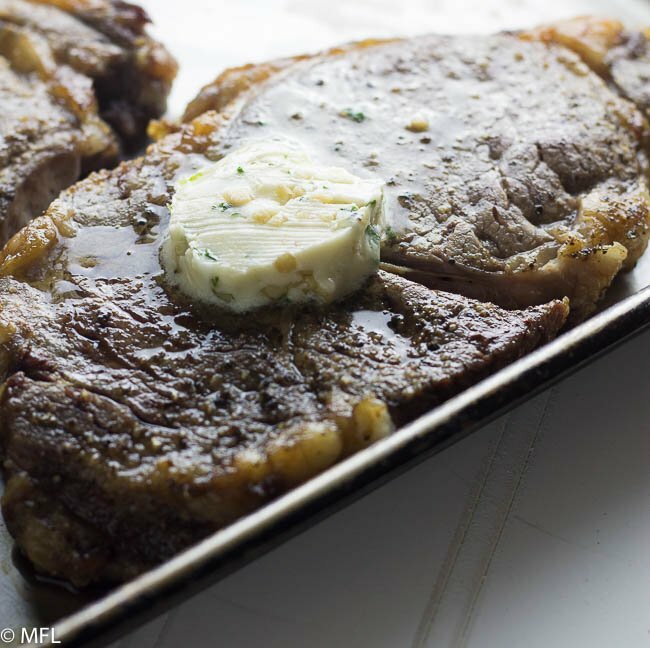 If you are wondering how to make the perfect air fryer steak than look no further. This method of cooking steak in the air fryer provides perfect juicy steak each and everytime. This post may contain affiliate links, read my full disclosure here. I only had the intention of making fried foods when I purchased my Air Fryer . Little did I know how amazing this appliance was and that it could make much more than fried food. I already used it to make chicken for my Healthier General Tso’s Chicken in the Air Fryer and I used it often for roasting vegetables, but that was it. Then I discovered that my air fryer could make juicy steak. Well to be fair, it wasn’t my discovery…I was scrolling through Facebook and someone posted a picture of a beautiful ribeye they had prepared in their air fryer. 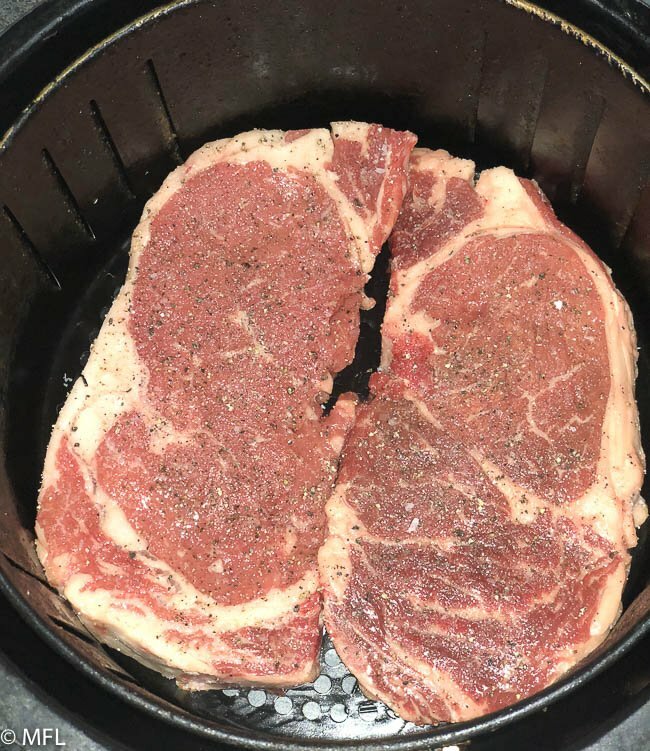 I was so in awe and excited about steak in the air fryer that I couldn’t wait to tell my husband. I expected him to be just as shocked and in awe as I was but apparently he already knew that the air fryer could cook steak. Unbeknownst to me, there is a picture of a steak with cooking times right on the side of my air fryer. I guess I’m not that observant. Either way, I was determined to make steak in my air fryer and I went out and bought a ribeye that very same day. 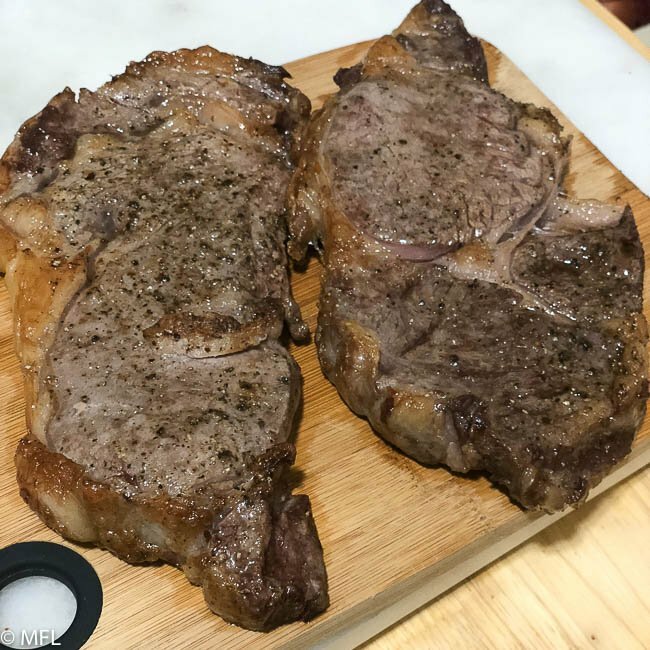 I followed the directions as indicated on my air fryer and I was amazed at how simple and easy it was to make a beautiful steak in the air fryer. I actually felt kind of bad because it really takes no skill at all to create the perfect steak when it’s cooked in the air fryer. It’s now my go to way to prepare steak. 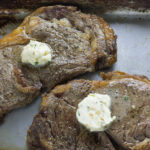 Top your steaks with my homemade garlic butter that can be whipped up easily and can go on many dishes including fish, bread, and vegetables. I like to create more than we need for our steaks and save the rest for later in the fridge. I would eat the stuff by the spoonful if I could. Many people will read this and wonder why even bother making a steak in the air fryer. 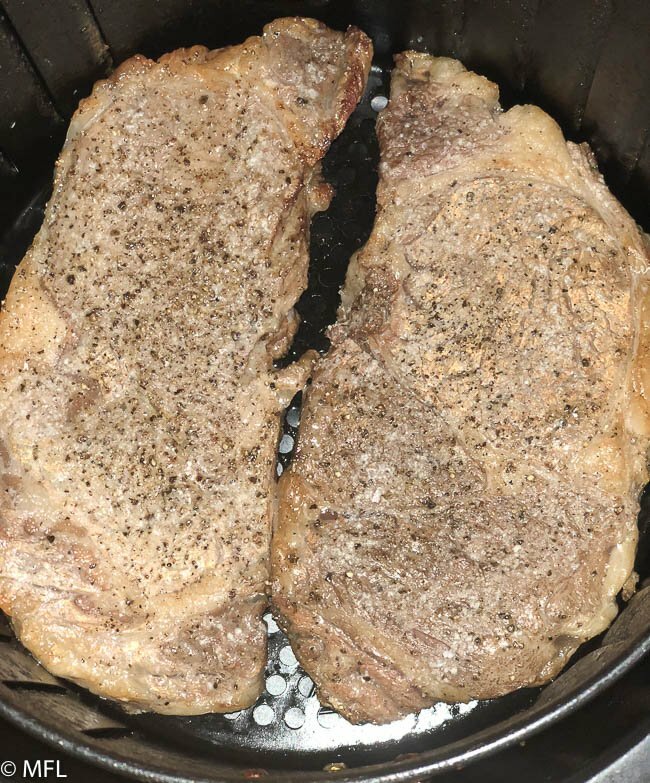 Yes, steaks on the grill are amazing and a cast iron steak is also a good alternative but there are many reasons why some may choose to cook steak in an air fryer. Your steak gets cooked perfectly every time. Since the air fryer is operated in a small space with a fan, the heat temperature is consistent. 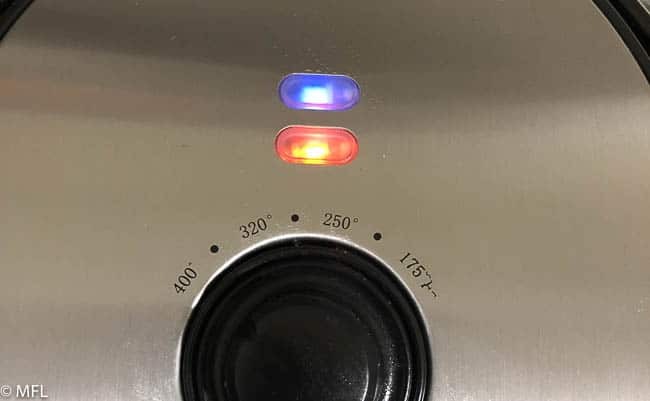 This means everytime you decide to make a steak, it will be cooked at the perfect temperature and come out just the way you want it so long as you follow your time settings. It’s a hands off dinner. I literally season my steaks, place them in the air fryer, and flip when my halfway timer goes off. There is no need for me to watch it. This comes in handy when I’m going back and forth between my kitchen and my dining room to help my daughter with her homework. The stove/grill isn’t always available. My husband does all the grilling in our house and his steaks are AMAZING but it’s not always grill weather. Also, my stove top steaks always get finished in the oven, which can make the house hot. With the air fryer, everything gets done in the air fryer basket and you don’t have to worry about the whole house getting hot. The beauty about air fryer steak is that you can make different cuts in the air fryer. I’ve made delicious filet mignon, skirt steak, and ribeye. Just remember to adjust cooking times based on thickness of steak and doneness preference. If you’re looking for a place to get awesome steaks and other meats, try Butcher Box. They are a meat delivery service specializing in grass fed and organic meats. You can check out my unboxing of my first meat order on Facebook. Perfect juicy air fryer steak. 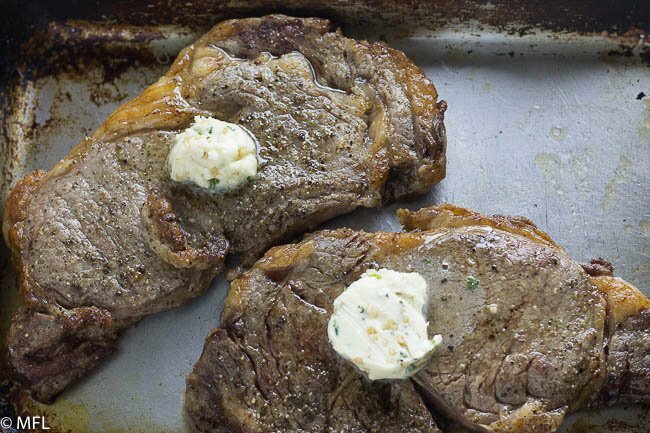 Prepare Garlic Butter by mixing butter, parsley garlic, worcestershire sauce, and salt until thoroughly combined. 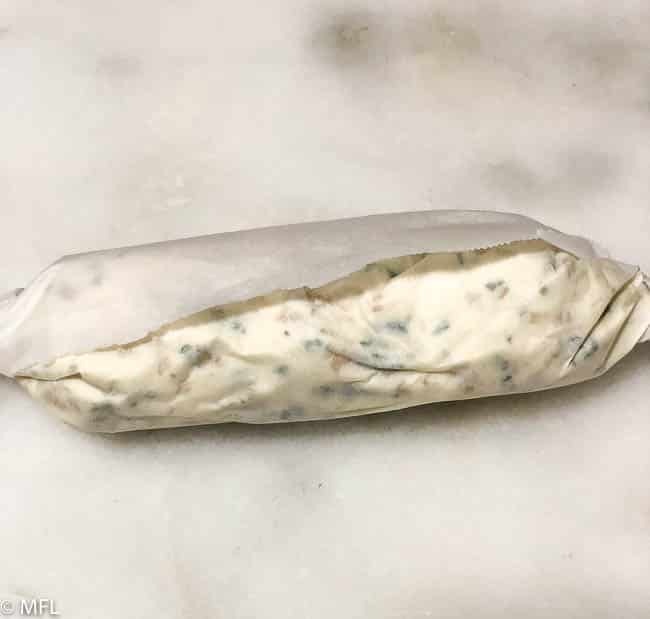 Place in parchment paper and roll into a log. Refrigerate until ready to use. Remove steak from fridge and allow to sit at room temperature for 20 minutes. Rub a little bit of olive oil on both side of the steak and season with salt and freshly cracked black pepper. Remove from air fryer and allow to rest for 5 minutes. Top with garlic butter. *Adding olive oil to the steaks is optional. I do it for flavor. *This recipe creates Medium cooked steak. For medium rare, cook for 10 minutes, flipping halfway through. For medium well, cook for 14 minutes, flipping halfway through. To ensure it is done to your liking, use a quick read thermometer to check the temperature. 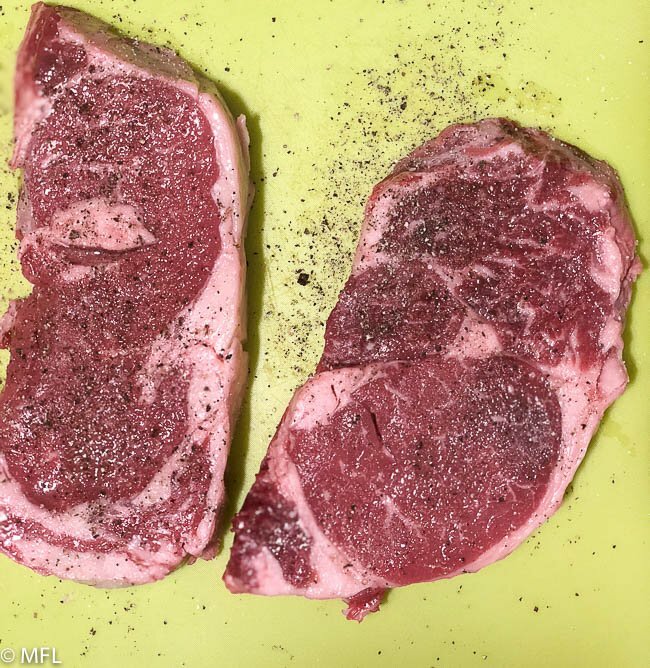 I personally like Butcher Box ribeyes. 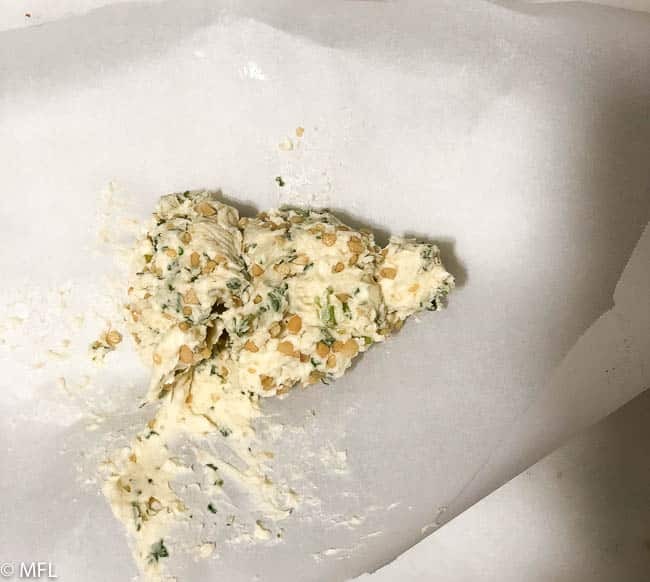 Roll butter into a log. Season steak with olive oil, salt, and pepper. Preheat Air Fryer. Mine is preheated once the orange light goes off. Place steaks in oiled Air Fryer basket. Cook steaks for 1-14 minutes, flipping halfway through. My steaks after 6 minutes on one side. My steaks after 12 minutes, flipped halfway. 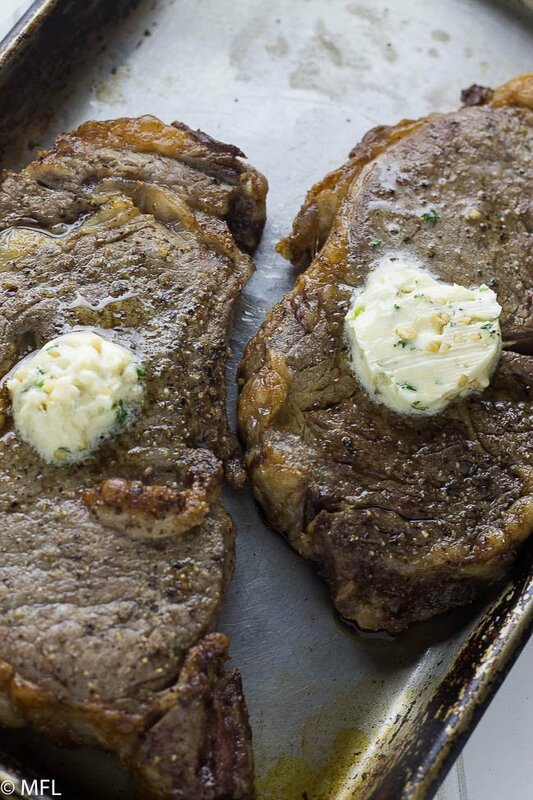 Allow steaks to rest for 5 minutes and top with garlic butter. Where do you but rack when you are air frieing a stake ?? I don’t use a rack for the steak. I just place it directly in the Air Fryer basket. Pleasantly surprised (my first steak in air fryer), absolutely delicious!! And, that butter, WoW! Thank you for sharing. Filet mignon in Air-Fryer was cooked to perfection! 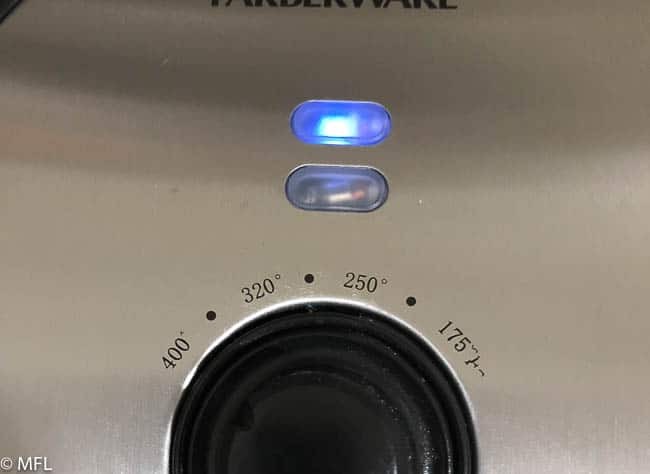 I know you said to preheat at 400 degrees but what temperature do I cook the steamed at? 400? Hi Carolyn, it’s cooked at 400 degrees. I am not a steak lover but my wife and daughter both are and both of them loved this recipe. Perfection!!! Thoroughly enjoyed your steak recipe! Thank you!!! The steakalook great! 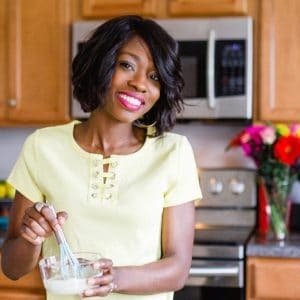 I cook in my air fryer all of the time. I will have to try this.